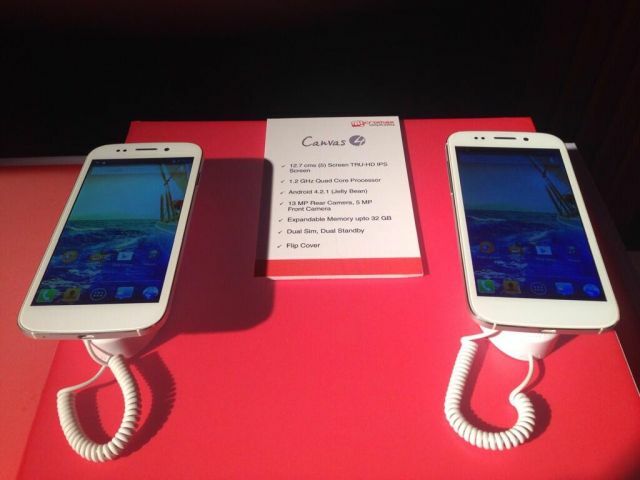 Micromax Mobiles launched its new flagship device in Canvas series, its Canvas 4. Micromax Canvas 4 is the successor of Canvas HD, the device has 1.2 GHz Quad-Core Processor, 5-inch TRUE-HD IPS Display with 1280 x 720 resolution, 13 MP Primary camera and 5 MP Front Camera and Dual SIM with Dual Standby. The Micromax Canvas 4 runs on Android 4.2.1 Jelly Bean and soon it’ll be upgraded to Android 4.2.2 Jelly Bean. The device has 1 GB RAM, 8 GB Internal Memory and MicroSD card support up to 32 GB. The device is powered by 2000 mAh Battery. Micromax Canvas 4 encased in a sleek aluminium body, top part of the housing is used for GPS, Wi-Fi and BT Antenna, while the bottom part of the housing is used for GSM and WCDMA. The phone has very special and unique feature ‘Ready to blow’, you can unlock the phone by blowing kisses on phone lockscreen or shake the phone. The phone comes with 13 MP Primary camera with LED Flash and auto focus. Other features include a burst mode (up to 99 shots), horizontal & vertical panorama, Record 1080p HD Videos at a striking 30 fps rate. Canvas 4 borrowed some features from Galaxy S3/S4 such as Video pinning, video playback will stop if eyes look away etc. The Canvas 4 preloadded with some apps like Music hub, Foneclay, Hike messenger, Spuul, MSecurity, Opera and MLive. The Micromax Canvas 4 priced at: Rs. 17,999 including Free Flip cover worth Rs. 3000. The phone is available in two colors: Grey and White.